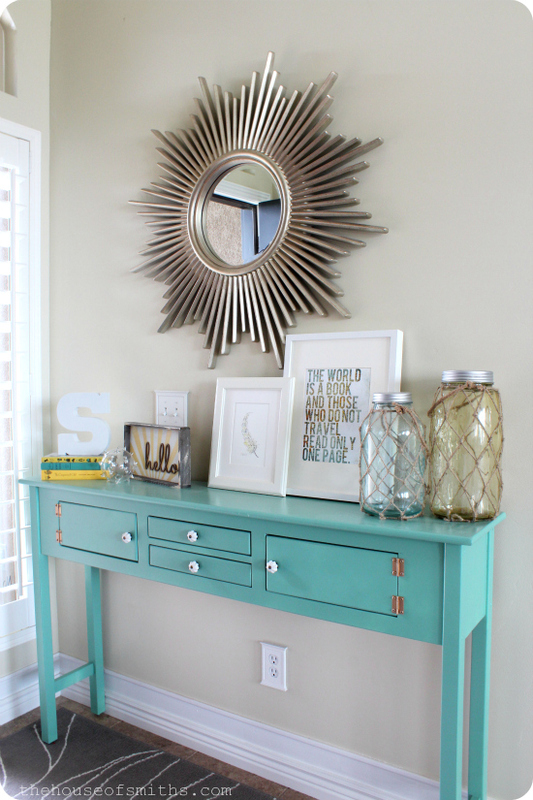 Can I just say how much I love a great entryway in a home? It's actually one of those super-important things on my list that will HAVE to be considered if we ever move into another house. No entryway - NO WAY! In my wildest (yet still sorta realistic dreams) I'd LOVE an entryway similar to this one below. Breathtaking large front door with plenty of windows for light to pour through, overly wide in size, spacious, airy, encased in white chunky molding, a statement light that knocks your socks off, a fab entryway table, and even a small spot to sit more than one person, so that you can invite people inside... without having to always "invite them ALL the way inside." If you know what I mean. AKA: Welcome to my messy living room, dirty kitchen and unmade beds down the hallway. bleeeh. 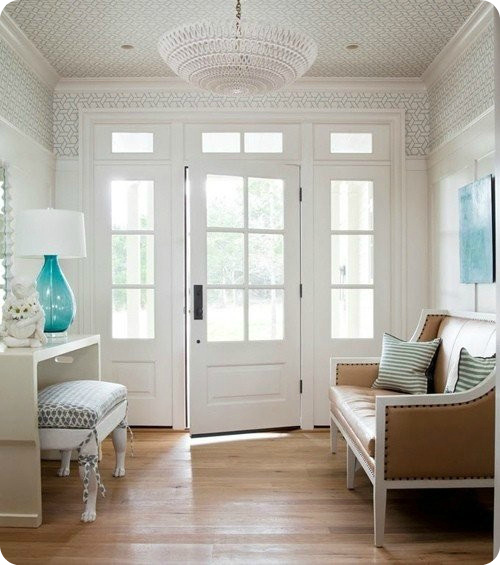 Shhhh.... A moment of silence please, for the most perfect entryway that you ever did see. I actually had a dream about this entryway once. Okay, all of that depressing, never-gonna-happen stuff aside, I'm quite honestly just happy to have an entryway in this house AT ALL! Our quarters may be tight, but with our trusty little entryway table, and lots of different decor change-ups... we've been really happy with this area of our home! All that being said, I got asked the other day by a friend what types of things she should include in her entryway, now that she's moving into a new home. 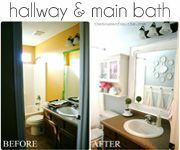 I instantly felt like an expert in this category, because after having to work with OUR tricky entryway, and dreaming about other ones... I've got a pretty good idea of what kinds of basic things make even the smallest entryways inviting and cozy. I've even been finding lots of things on eBay to throw into my collections, so you fabulous people, as well as my cute friend, would have a place to go and check out some awesome entryway elements like the ones below. I've made 12 different collections on eBay so far; you can follow me here if you'd like and you can get started with your own collections too! 1. Statement lighting - Go bold and beautiful. I feel like this light, if any, is the most important in your home. Remember, this is the first fixture that most people will see in your space, so make it count! 2. A Great Mirror - Metallic and sunburst, chunky, wooden and framed or a simple beveled edged infinity mirror... whatever style it may be, just make sure to have one. Mirrors reflect light and make spaces appear larger. Think of it as almost like adding in another window on a wall. 3. Vases & Apothecary Jars - Decorative vessels like these are perfect for adding greenery or floral arrangements - in addition to great height on one end of your entryway table. 4 & 5 - Natural Accents - Wooden bowls, orbs, sticks and weaved baskets are great things to incorporate into an entryway. It grounds the space and makes it feel cozy. 6. 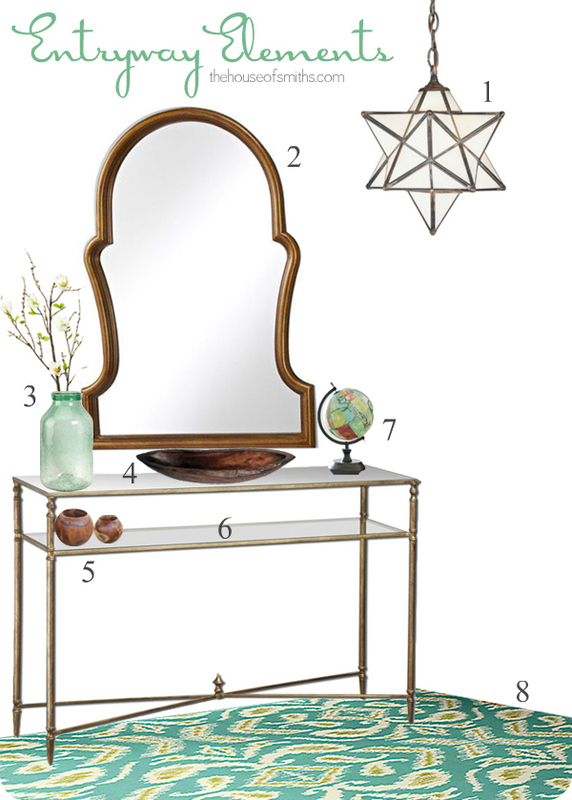 A Tailored Table - Finding a table that fits your entryway perfectly, is key. You want to make sure it's not too big, or too small. 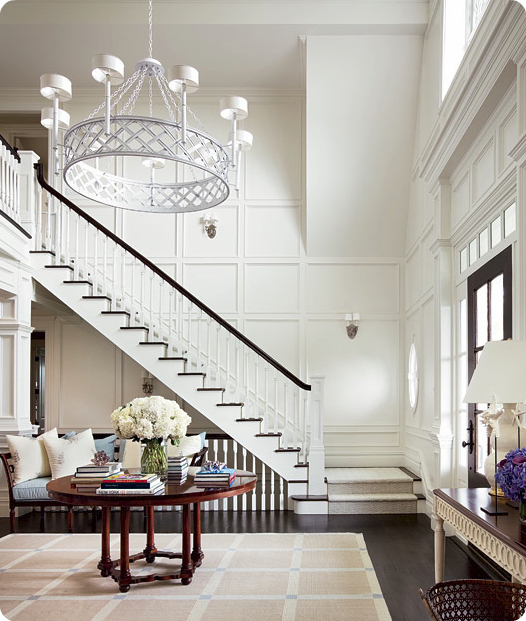 Going too far one way or another can make your entryway appear smaller and more cramped than it really may be. 7. 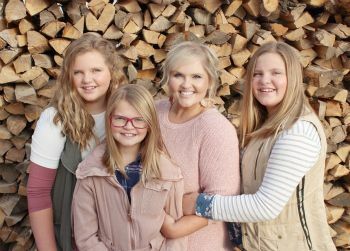 Personalized/Handmade Goods - Adding one of a kind handmade creations to your entryway space is one of the best way to showcase you and/or your family's personality! It's also a great way to support local handmade artisans in your area. 8. A Rug that Rocks - Laying down a colorful, dirt disguising, pretty patterned rug, is the the ultimate finishing touch for any awesome entryway space. Because this floor covering tends to act as more of an accent piece, don't be afraid to try something different and fun with your rug choice here. 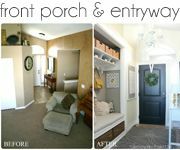 No matter what styles you get these main elements in, having them all combined together in some way or another is a big part of what can make your homes entryway go from good, to GREAT! 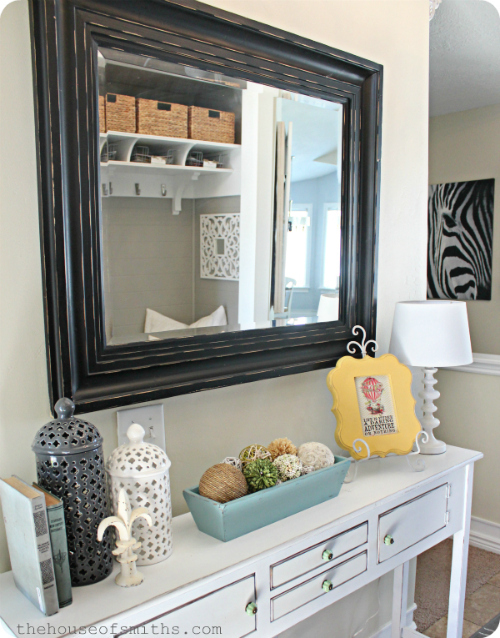 So much gorgeous entryway inspiration Shelley! I love finding things for my home on ebay, and I want that light fixture (#1) !! Wait, no place to sit down and take off your muddy shoes? No spot to hold the muddy shoes? No place to set the keys, purse, mail etc. while you help kids take off their muddy shoes? Bold lighting or a place to sit. I need a chair, please. I love that star pendant! We're renovating the exterior of our home with a new paint color and adding some craftsman details to our currently boring bungalow and a star pendant for over the back door is on my list! 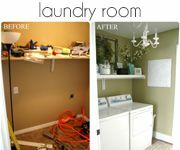 We have a small entry way at the back door as well and did a closet/mini mud room make over there as well. You're photos are inspiring me to jazz it up a bit more for the Holidays when we'll have lots of guest! Awesome. Our house just opens up to the living/dining room. I like the big open area but at times wish I had a small entry. OK this post made me laugh out loud...I love your big dreams! I think the rest of us just dream about having YOUR beautiful home ha! Wish I could borrow you and your mad skills for a day. Great tips...sometimes I just need somebody to spell it out for me, thanks!! 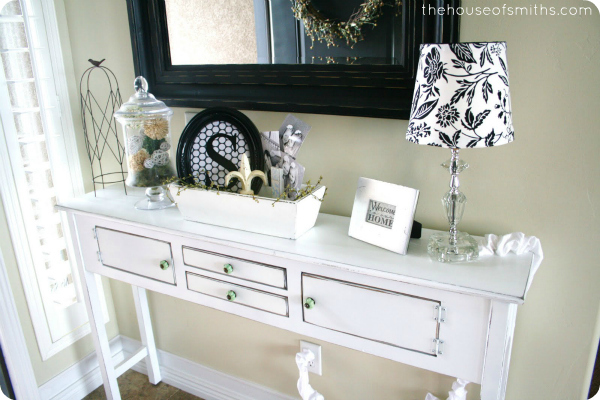 I love entryways! Our problem is we NEED an entry way for coats, shoes, mail, etc, but we dont actually have a place for an entry way. Our front door opens up driectly in our living room and I am so stuck on what to do so our entry space looks like it belongs. I would love to have a fancy entryway with a side mudroom, but that just isn't happening in our house. I need to figure out how to combine the two without the word "big" being used to describe the space at all! Do you know where I can get a star lantern like that one in the picture? I am dying for one but don't know where to look! Argh! No link to the star light? I'll have to go searching. I need that light. Our new house sadly doesn't have any walls in the entry, so in a few years we are absolutely going to be busting out the closet and doing exactly what you did with you closet!!! 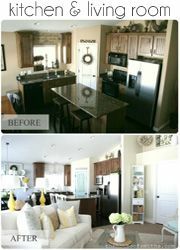 Thanks for the great pictures I can show the contractor!! I cannot even imagine having that big, glorious entryway. Ours is literally a long hallway, the width of the front door. I'm having the hardest time adding anything except coat hooks.